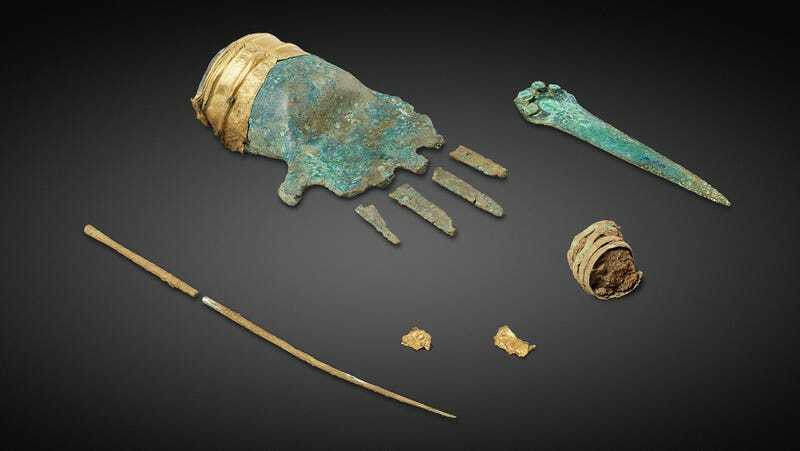 The bronze hand and other items found at the site in Switzerland. In October 2017, a pair of treasure-hunting metal detectorists made an extraordinary discovery near a Swiss lake: a sculpted bronze hand with a gold cuff dating back some 3,500 years. Archaeologists have never seen anything quite like it, and are at a loss to explain its purpose or function. And in an unfortunate turn, the hand is now at the center of a criminal investigation. The bronze hand and gold cuff. The site where the bronze hand and other artifacts were found. Sadly, this analysis is being complicated by the disturbed condition of the site; the researchers never had an opportunity to observe the grave in situ, that is, in its original, unperturbed state. There’s a lesson here: If you’re a so-called treasure hunter, or a person who’s accidentally stumbled upon something of archaeological significance, stop what you’re doing and call in the experts. Failure to do so means you’re just looting—and destroying history.